For the past few years, I’ve been recommending Wincent Colaiuta’s Synergy ( ; 5€) as my favorite way to control iTunes without actually switching to iTunes. It gives you customizable, system-wide hotkeys for many playback functions; a great informational display that pops up each time the track changes (or at your command); a systemwide menu that lets you choose playlists and recent tracks, and optional menu-bar playback controls that you can customize with downloadable button sets. Synergy will grab album art from the Internet if it’s not already in your iTunes Library, and you can even have Synergy run AppleScripts on track changes. Sure, there are many, many similar utilities out there—and I’ve tried most of them—but Synergy has the best combination of features, interface, and ease of use, in my opinion. That said, I recently found another iTunes controller that’s battling for time on my Macs, Sophia Teutschler’s CoverSutra 1.0 ( ; 10€). Not because it can compete with Synergy in terms of features; it can’t. Rather, because it’s simple, attractive, and, well, fun. 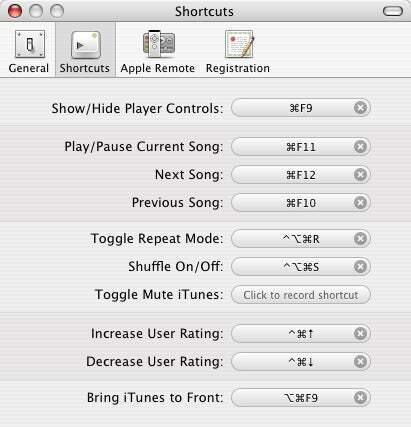 Like Synergy, CoverSutra lets you assign keyboard shortcuts to the most common iTunes actions; I use these shortcuts to control iTunes most of the time, rarely bringing iTunes to the front. Pressing one of these keyboard shortcuts results in visual onscreen feedback in the form of a symbol or, in the case of skipping to a different track, a symbol over the new track’s album art. You see a similar display—one that looks just like a CD jewel case and shows the album art, if it exists, of the current track—whenever the track changes; the title of the track itself is displayed just below the case. A clever touch: if no album art is present, CoverSutra displays a generic CD case with the artist and album names “handwritten” on it. You can enable a similar, always-showing CD-case display that you can place anywhere on your screen; this virtual CD case floats over your Desktop (but behind application windows) and lets you quickly see information about the current track. But my favorite feature of CoverSutra is its onscreen control window. By pressing your Player Controls keyboard shortcut, or choosing Show Player Controls from the CoverSutra menu (mentioned below), you get a translucent control window. (Mine is activated by pressing Command+F9.) Like Synergy’s informational display, this window shows the current track’s album art, album and song titles, artist name, and rating. But you also get controls for play/pause, forward, back, shuffle, repeat, and volume, as well as a progress slider, just like iTunes’s, that you can use to quickly skip to any point in the track. You can click on any rating star to give the current track that rating. The window is resizable and movable, and automatically fades away when you click anywhere else on the screen (or press escape, press Command+W, or click the close symbol). If you want to tweak the translucency of the window, Sophia has provided instructions on the Web site; hopefully this will be a simple preferences setting in future versions. A nice bonus is support for the Apple Remote. 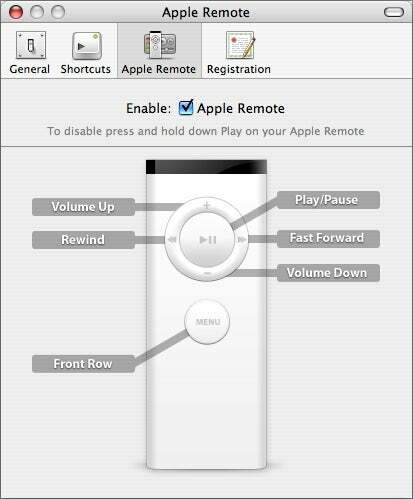 If you have a Remote-compatible Mac (recent Mac laptops, iMacs, and Mac minis), you can use your Apple Remote to control playback, even when iTunes is in the background. (The Apple Remote normally works with iTunes, but only if iTunes is the frontmost application.) You even get CoverSutra’s onscreen feedback when you press the Remote’s buttons, and if you want to use Front Row, the Menu button still works. You can also choose to place a CoverSutra menu in the menu bar; this menu offers quick access to several settings, as well as a list of recently-played tracks; choosing a track will play it again. My favorite setting in this menu is the Disable Shortcuts command, which lets you temporarily disable CoverSutra’s keyboard shortcuts—for example, if you’re using another application that happens to use the same shortcuts you’ve chosen for CoverSutra. As you might expect, CoverSutra 1.0, as an initial release, still has a few rough edges. For example, the Help menu item doesn’t actually give you any help, and when you quit CoverSutra, the recent songs listing is reset. I also experienced one “unexpected quit” while clicking the forward and back buttons—admittedly overzealously—during my testing. And, of course, CoverSutra doesn’t have nearly as many features as Synergy; for example, I miss the ability to quickly switch to a different playlist from the menu bar. But CoverSutra has a great interface and is easy (and fun) to use. I’ve been using it exclusively for the past couple weeks, and the truth is, I don’t miss Synergy as much as I expected. With a few more features, CoverSutra has a chance at replacing Synergy on my Macs. 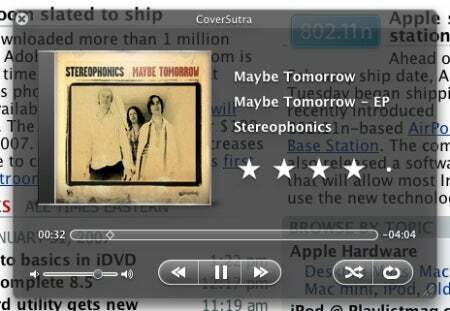 CoverSutra require Mac OS X 10.4 or later and iTunes 7.0.2 or later; it is a Universal binary.